Anthem® Electronics Blog | News & Updates: February Sweepstakes: Win an Anthem MRX 310 A/V receiver from Home Theater Review! 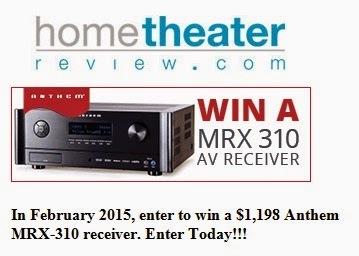 February Sweepstakes: Win an Anthem MRX 310 A/V receiver from Home Theater Review! For the month of February, Home Theater Review is giving you the opportunity to win an Anthem MRX 310. All you have to do is enter their sweepstakes! Click here! to enter to win a MRX 310. Click here! to learn more about Anthem receivers.